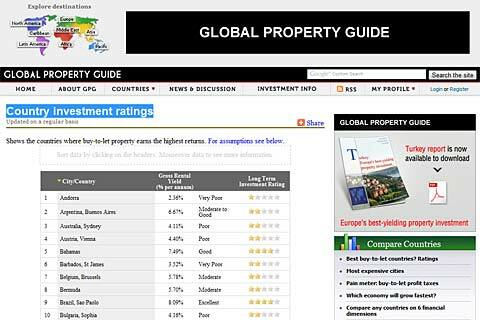 Today we look at the Global Property Guide website. A web site for individuals who want to invest in property abroad, but need an independent guide before making a commitment. We took time out to review this unique site. The site is set up for investors who may already know what countries they are interested in and what type of house they want to buy. The site guide provides finer details on the unknown, such as the rent you might earn in another country and what you’ll be taxed or what the landlord and tenant law is in the country. The site is a “magazine style layout” and was particularly easy to use as a world map on the top left hand corner provided the top navigation into the various “Continent sections”. This made navigation considerably fast and intuitive. Potentially the site could be confusing because it is huge and could of hit a disaster with so many documents in so many countries, yet the map navigation works so well, within two clicks I was in the correct section of the country of interest. Each section provided regional statistics, an overview, price history, rental yields, taxes and costs, tax on rent examples, buying guide, landlord and tenant guide, country statistics and a lot more detail. There is a regular monthly newsletter to subscribe to and of most value was the Country Investment Ratings section (Peru, Lima is the best place for long term return on investment at the moment). Registration took no time at all and enabled the Newsletter subscription process at the same time. Matthew Montagu-Pollock, the Global Property Guide publisher told us, “Our site is quite different from most property portals. First, we genuinely provide objective analysis, completely uninfluenced by advertising. Second, we are investment-oriented, rather than second-home focused. We figure out which country and which city, at any time, offers the best rental returns and the best chance of capital gains, taking into account taxation, landlord and tenant law, and all other considerations. What’s more we present this to the reader entirely free, and with no need to sign up. It’s the most information-rich site in overseas property”. If you really want an information rich guide for investing abroad, but want it without the cost, then this is a super site, full of reports and statistics, constantly updated, and one to bookmark. For people looking to invest abroad, ths site is practical and objective. Investors who have properties in the UK who wish to let these out may find help from Property Leaders UK (www.propertyleadersuk.com).